Image courtesy of Pat Loika. Licensed under CCY BY 2.0. 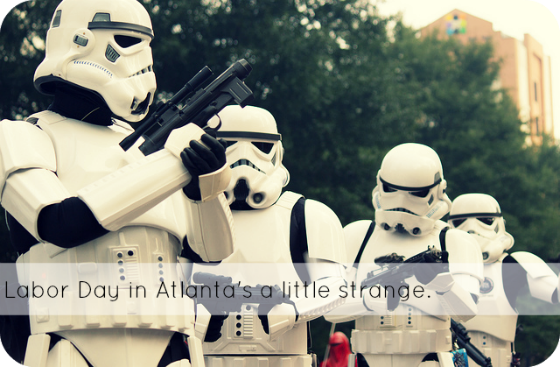 Labor Day weekend is, as I have mentioned before, a Busy Weekend in Atlanta. Since, as a city, we don’t know how to schedule things in a reasonable fashion, Labor Day weekend is host to: Dragon Con (largest independent sci fi/fantasy convention in the country), the Decatur Book Festival (largest independent book festival in the country), and Black Gay Pride (largest Black Gay Pride celebration in the country). Plus there’s a massive college football thing. This happens every year. It is a delightful logistical nightmare. Several hundred thousand people with really intense, really disparate interests descend on a city that is an infrastructure nightmare at the best of times. Labor Day weekend is, of course, the Best. Normally, I confine myself to the quiet nerds at the Decatur Book Festival. They drink beer, (politely), and care about books (politely), and listen to readings (politely). They go home at 5. There are no after parties. But this year, I decided that I had to spend at least a day amongst the rowdier nerds: I was going to try to go to Dragon Con.